I'm so proud to be able to highlight for you something very special from one of our members, Dave Hearn, and his colleagues and cohorts at the Mischief Theatre Company: 'The Play That Goes Wrong'. Don't let the title fool you – nothing goes wrong in this absolutely hysterical comedy. And everything that does go quite intentionally wrong from the highly creative and breathtakingly talented team behind this production is a hundred per cent spot on right. The Play That Goes Wrong was written by Jonathan Sayer, Henry Lewis and Henry Shields. I was treated to an evening out to watch the play by Jonathan's agents at United and I came to the theatre knowing very little about it. And that was a massive bonus for me as the ingenuity and audaciousness of what the team pulled off was all the more hysterical for it. I'm reluctant to describe some of the jewels and classic moments from this gem of a production, as, due to its popularity and success, it's about to start another run at the Trafalgar Studios on 2nd July and I'd love as many of you as possible to catch it in the same way I did without any preconceived notions. To describe the play's funniest moments would be to spoil the magic of having them revealed to you as they were to me. The play was originally on at the Old Red Lion and due to its success moved to the Trafalgar Studios. The small intimate setting is perfect for 'The Play that Goes Wrong' as it's literally so astonishingly clever and painfully, almost unbearably, funny that it feels like sitting around a living room with your best mates and laughing till you can no longer stand it. And indeed the whole audience became involved. I've never been present at a theatre production where the entire audience were in fits of laughter – literally from the beginning of the play to the end. If, like me, you don't know everything about the play's central conceit, as you begin to realise what this marvellous young theatre group have set out to pull off your heart begins to beat faster for them, almost like watching one of your countrymen in an Olympic race – not quite sure whether they're actually going to steal gold, but willing them on all the way. And steal gold this terrific ensemble cast and the team behind them do. With such a group of talents working so flawlessly together it's almost unfair to give any one of them special mention over another, but I must give Jonathan and the two Henrys who wrote the play a special nod for having the courage to create something so intricate and clever, a piece that works perfectly and is testament to them having the wit and mettle to try something so challenging. On the acting front the team work as one, only a group of young actors so in sync with each other on every level could make something look out of sync so effortlessly. And again, while not wanting to salute any one of them any higher than the other, I'm sure all the male members of the cast won't mind me giving special mention to the two astonishing leading ladies who pulled off extremely challenging roles with an inordinate combination of pluckiness and comic timing, not to mention physical dexterity. Their measured performances were one of the show's subtle highlights and it makes me laugh to even think about them now. How did the idea for TPTGW come about? We've been together as a company for just over five years, performing improvised comedy (mainly our flagship show Lights! Camera! Improvise!) After last Edinburgh a few of us started talking about writing something for the Company and doing some scripted work. We wanted to write something that was funny but kept the sense of spontaneity and danger that improv creates; so the idea of writing a Play that slowly falls apart really resonated and excited us. Henry (Lewis) had actually written a short play when he was a lot younger that we based the whole thing on. How much talking, planning, kicking about of ideas happened before the writing process? To be honest not that much, it was so much fun to write and didn't feel like work at all. At the time we were all working in pubs and restaurants so getting home and writing together was the part of the day we looked forward to. We just sat together and made each other laugh. The first draft only took about a fortnight to write but we've been tweaking and changing it ever since. Which films, plays, did you turn to for reference in the writing process? 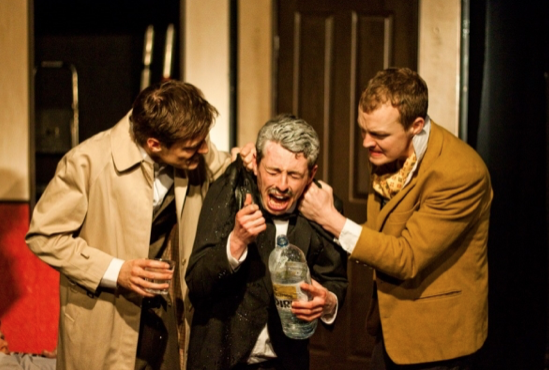 There are three writers so there are a fair few….Henry was lucky enough to be taught by Michael Green who wrote the course acting play, and we all did a lot of Lecoq clowning when we were at drama school (We all went to LAMDA). I'm a huge silent film fan so there's the odd subtle nod to Chaplin and Keaton (particularly Steamboat Bill Jrn). I'd say there's a lot of status play that you could say comes from Laurel and Hardy and although we watched it after we had written the play we all love Waiting for Guffman. What was the process like of rehearsing such an intricate piece? I think having a background in improv is a huge advantage. It means that we are all fairly comfortable to just get up and try stuff. There's a lot of physical business that had to be drilled but we found a lot of it through just having a go. There's been surprisingly few injuries! We also have a great director in Mark Bell who taught us at LAMDA. He does a lot of character based improvisation with us and works in a lot of detail to make sure that the work stays specific. It must be much harder to pull off a play that intentionally goes wrong than one might imagine. What was the hardest part for you all? It does come with its challenges. I think you have to make sure you are very good at something to attempt to do it badly and entertain people at the same time. (Les Dawson used to practice playing the piano badly for hours upon end and is amazing at it). The Hardest part of doing the play is remembering what is part of the play within the play and what is The Play that goes Wrong. It sounds like a bit of a metaphysical nightmare but after you've done the show over one hundred times doing it wrong becomes doing it right. You have to stay very focused to make sure you keep the stakes high and the story alive. I think if you lose that it stops being funny. The response has been wonderful, from both critics and audience reaction, what's the feeling of having something so well received like? It's been fantastic; we've all been together for a long time and worked very hard so it means a lot to receive such a positive reaction for the work. We've been quite overwhelmed to be honest. What's next for you all? In the short term we have extended our run at Trafalgar Studio's by another 3 weeks until July 20th! We are doing 14 shows a week so we will be very busy. Then we head up to Edinburgh Fringe where we are performing at The Pleasance above. In the long term we are looking forward to developing The Play that Goes Wrong. There's hopefully going to be a few translated productions outside the UK and we want to keep performing the play for as long as people want to see it. We are also developing another 'Goes Wrong play.' I can't talk too much about it yet but we are hoping it will be around by Christmas time this year.... we might even do a sneak preview after one of our shows during this run. You can get 2 tickets for the price of 1 for the late show (9.15) on Thursday 4th July and both shows shows (7:45 and 9:15) on Monday 8th. Simply quote the BFA on the phone or when booking online to take advantage. Please join me in thanking Jonathan, Dave and the whole team for letting us have this offer and also join me in congratulating them on all they have achieved. Written by Jonathan Sayer, Henry Shields and Henry Lewis. Cast: Henry Shields, Henry Lewis, Greg Tannahil, Jonathan Sayer, Lotti Maddox, Dave Hearn, Nancy Wallinger & Rob Falconer. was undeniably a lesson in comedic virtuosity"
here in what is a sublime display of physical comedy"
"Without a doubt, the funniest show that I've seen in months"
"The performances are all excellent and refreshingly unique"
"I loved it" A great comedy"